Check out Tobi's Hit Every Nerve Blouse Keep things sleek and simple in the Hit Every Nerve Ivory Blouse. This long sleeve collared top features contrast stitching, a front pocket, and button up detailing. This satin blouse looks so fab tucked in with mom jeans. Or for a more casual look, this top can double as chic loungewear. 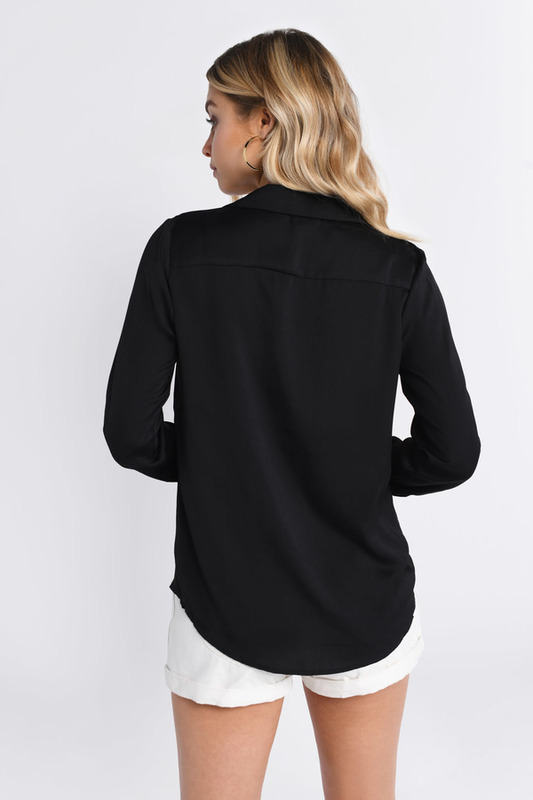 Keep things sleek and simple in the Hit Every Nerve Black Blouse. This long sleeve collared top features contrast stitching, a front pocket, and button up detailing. This satin blouse looks so fab tucked in with mom jeans. Or for a more casual look, this top can double as chic loungewear. Keep things sleek and simple in the Hit Every Nerve Ivory Blouse. This long sleeve collared top features contrast stitching, a front pocket, and button up detailing. This satin blouse looks so fab tucked in with mom jeans. Or for a more casual look, this top can double as chic loungewear.